I’ve received a lot of questions from individuals who have run into trouble with their LLC’s and have tried to answer them to the best of my ability. Unfortunately I’m not a lawyer, but thankfully I know someone who is, so this guest post is brought to you by Andrew Flusche and I really hope you find his advice useful! You and your two best buddies have finally decided to start a business together. You have a great business plan, a killer idea, and even some cash to get started. But what happens when one of you wants out? Or what if somebody is in a tragic accident? This is why your business needs a written agreement. Everybody is friends when a business is started. Who would start a business with their enemy? But crazy things can happen while running a business, and many friendships are unexpectedly broken. Even if you remain great friends throughout the venture, other things can happen. One of your business partners might pass away. Or somebody might want to sell their share in the business. Part of your startup planning should cover these situations. You can’t plan for everything, but you can catch a lot of possibilities. This is where you can get advice from experienced business people: ask what types of problems they’ve had to deal with. Make sure you’re ready for anything they’ve been through. The best planning in the world isn’t going to matter if it has no legal force. This is where a formal agreement is important. I know you’re best buddies with your business partners, but that’s no reason to neglect entering into a proper agreement with them. In fact, if you are friends, it should be easy to sit down and sign the paperwork. Depending upon the type of business you setup, your formal agreement will have different names–but it still covers the major issues. 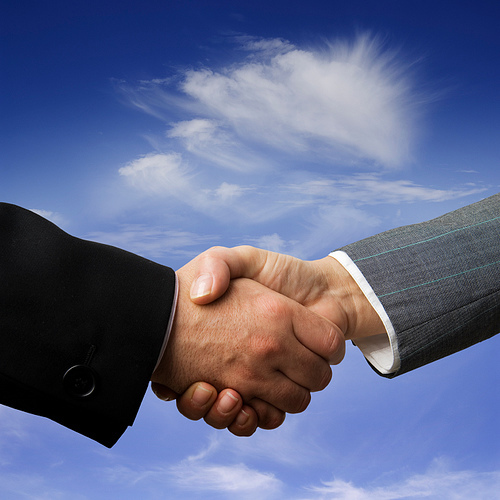 Partnership – This is the most informal business comprised of more than one person. You don’t have to jump through any legal hoops. You just operate the business and share the profits in some way. Since the entity is informal, you really need to make sure to have a Partnership Agreement. Specify how profits and losses will be shared, how a partner can leave & enter, etc. Have all the partners sign it. Limited Liability Company – LLCs are great business entities. They provide limited liability, but they are flexible. You still want to have all the LLC members sign an Operating Agreement that covers the key issues of operation, dissolution, share valuation, and other topics. Corporation – If you’ve formed a formal corporation, you still need to have Bylaws. This is the corporation’s formal agreement that explains how the company will be run. If you fail to plan, you’re doomed for problems down the road. But the future will be smoother if you plan, put your plans into an agreement, and sign it. Every business has problems, but don’t let a lack of an agreement be one of yours. It’s always tempting to save money by drafting contracts and agreements on your own. These days you can even find lots of samples online. But do you really want to cut corners with something that is integral to your business? There’s a reason lawyers go to school, get licensed, and take continuing education courses. This stuff isn’t easy. If your business agreement isn’t properly drafted, it could actually create more problems than it solves. You should always consult a lawyer when you need important agreements drawn up. Andrew Flusche is a University of Virginia School of Law graduate and runs his own law firm in Fredericksburg, Virginia. He focuses on estate planning, businesses law, and defends people charged with Virginia reckless driving. You can learn more about Andrew, as well as get in contact with him at his website andrewflusche.com. Thanks for inviting me to write for your blog, Tomas. Keep up the great work! @Andrew Flusche – It was my pleasure, and thanks again for the guest post! I just had to comment on this because it’s so important – and so many people overlook it. Yes, it costs money to hire an attorney, but it costs so much more to deal with poorly-drafted agreements that leave you unprotected. I was a corporate trial lawyer for several years and saw firsthand what happens when deals/ventures go bad – former “best friends” are suddenly arch enemies fighting for every dollar tooth and nail. So get your agreements in writing and hire a lawyer if at all possible. @Traci Feit Love – Hey Traci, thank you so much for the comment. You won’t believe how many comments I’ve received from people that have gone into business with one another only to see the relationship go sour, and they’re left scrambling trying to figure out how to get out before things get worse. iii)	Why is it important for a partnership to draw up a written agreement?